This is my husband. Can you tell what he loves to do the most. No, it's not working, nor is it gardening all though he does like that. 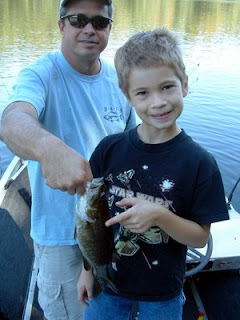 He loves to fish. Is there anything else in life?!? 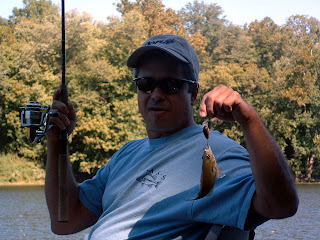 He is always catching fish even when the other guys he goes with don't. He's got the touch. The man below is my father. He passed away two years ago. My grandfather died on Fathers Day 16 years ago. Do I missed them, you bet. But I have such wonderful memories of both of them. My dad loved to horse around with the kids. He would play ball, cowbows and Indians, even barbie and all babies, bar none, bounced on top of his knees. My grandfather was a story teller and quite a good one. He always new how to bait and hook you in a story and bam he'd get you at the end of the story. Everybody would always laugh. He used to tell the same story to my dad over and over but tell it a different way each time and always have the same ending. My grandad and father always had a great sense of humor. Here my dad is playing monster. You can't hear the roaring from him, but my kids and all adults alike would laugh and run! 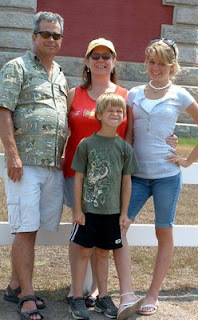 This is my family when we went to Hatteras Island. It was wonderful. I want to move there. Can we go now. This is what all fathers should be doing with their kids today! Not necessarily fishing, not all like to fish, but spending time with the blessings God gave them. This is a father's opportunity to share what he knows, enjoy the laughter of a child and ask God to help him grow in wisdom and grace. My husband is very smart. He is good at anything he puts his mind to! He loves his kids. Happy Fathers Day! How many ways can you mess up a blog? Well I have become an expert at that. I originally had a wonderful designer create my blog for me. She did a lovely job. See the banner above. But I found free blog templates and wanted to try it out. Little did I know that my blog was very well programmed to stay the way it was. I entered my newly found template, very excited to see my new look for kicks and walla!!! All that hard work GONE! What did I do??? I didn't want to change anything but the background to see if I could. Oh brother, everything was gone, gone, gone. I slumped over in my chair horrified at what I had done, terrified to approach my wonderful web designer. So off I went to fix it myself. Do you hear the song "We're off to see the wizard" playing in the background? That's what I heard. I looked at several different blogs to see where they got their graphics and researched each and every one. Checked out how to load them into my blog. Contacted anybody who would listen and bombarded them with blog questions. Everyone was wonderful! I finally ate crow and told my web designer (Kim, Craftisan Graphics) what I had done and how I messed it all up. She was so sweet. Thank God for folks who just know that some of us should NEVER be computer designers, maybe we should never go near computers. LOL! Next I tried several different backgrounds on and finally settled on one. I contacted my banner gal (Deena Davis) and asked her to create a matching banner for my current blog color at the time. She did. It was wonderful, I love those fairies. Aren't they sweet. But my blog looked too busy. Well I wasn't gettin' rid of those fairies, no way now how. I found yet another blog background to fit with my new fairy banner. Yep! I think it finally looks groovy. Hope you all like it because I'm a to tired to fix it again. LOL! Yep. It's true, Lauren turned seventeen today! I can't believe it. My baby is now a big girl. Beautiful, lovely and smart as a whip. She is amazing to me, her wit, intelligence, its overwhelming and sometimes sad. I know that sounds odd but I am mourning the loss of my little girl but enjoying the new experience of my teen daughter. Above are the pics that say it all about Lauren. She LOVE's horses, always has, always will. Her skill on a horse is amazing. She was the student all instructors went to to put on the bad horse. The unruly horse. She now rides a horse that no one can ride because she has what they call a "horse whispering" skill. She gets on the horse and listens and takes her time to understand how this horse ticks, what makes it work and then rides. All her instructors used her for that very purpose. Amazing. Her prom pic is with her boyfriend. They look amazing. She has a figure anyone would die for. I have never seen her look so gorgous. Sparkles in her hair and the color of that dress was perfect for her. Simply stunning. She also loves cheerleading. She is very personable. No matter what my girl does, she is good at it. Now if I could just get her to clean her room, that would be the icing on the cake. Happy Birthday my beautiful daughter. The Little Mouse that Could! What an amazing mouse she has been. She is my number one best seller! This little mouse has been made into many forms. 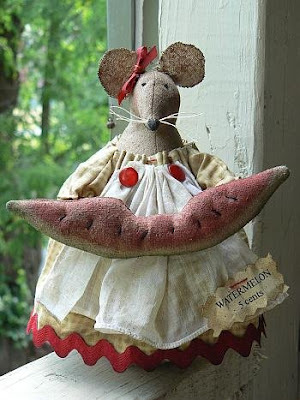 She originated as "Betsy Mouse". 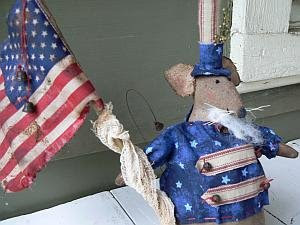 Then "Auntie Em", soon she had cousins, friends and then her "Uncle Sam" came to town. It has been an amazing ride with this wonderful little mouse. Her pattern is also a best seller for me as well. What causes folks to fall in love with such a little object, I don't know. Is it her face, that gentle little smile. Her willingness to always share what she has (as long as you don't mind her taking a nibble first). Both of these mice sold right away. One never made it onto one of my sites for sale. Silly huh! Greatful yes. So I want to thank Lyana, my mouse lady, for loving these little darlings. I hope she is well stocked with cheese. More mice are sure to come. New ideas for them are whirling around in my head and will start creating new ones soon. But I need to get some more cheese in my fridge first. LOL! Have a great day!